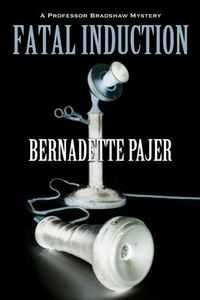 Fatal Induction by Bernadette Pajer, a Mysterious Review. Review: Professor Benjamin Bradshaw has a number of puzzles to ponder over, not the least of which is an abandoned horse and wagon outside his home, in Fatal Induction, the second mystery in this historical series set in early 20th century Seattle by Bernadette Pajer. The wagon, which clearly was a home for two people, wouldn't have concerned him so much had he not found a much-loved doll inside, suggesting to Bradshaw that its owner was a young girl and that she wouldn't have willingly left it behind. The police believe that it was home to a pair of gypsies, who have now moved on … and not their concern. But that changes when Bradshaw discovers that his young son Justin has been sheltering the missing girl in their attic, and as soon as he learns this she runs away. Justin tells his father that the girl says she witnessed her own father being murdered, and now fears for her life. Meanwhile, Bradshaw has entered a contest to provide the sounds of the theater direct to the comfort of people's homes. When life presented difficulties over which he had no control — such as the fate of President McKinley, the plight of a missing father and child, a troubled young man's soul, and his attraction to a girl he must never pursue — the lure [of scientific discovery] was greater. The above sentence summarizes how much information is packed into this mystery. Some of this, such as the attempt on the President's life, is simply historical context and some, such as the romantic angle, spans the series to date. The rest is specific to this story and it's a good one. Though a foundation for the mystery is laid right at the beginning, it takes a while for Bradshaw to get seriously involved … or at least become aware that something sinister is afoot. The scope expands quite a bit in the second half, but is never overwhelming. The science behind Bradshaw's inventions can be a little intimidating at times, but everything fits contextually within the story. Bradshaw makes an interesting observation with respect to the contest he has entered, that applies as well to the case of the missing girl: "That was often the difficulty in scientific investigation: assumptions could so easily be regarded as facts. Details you never questions could turn out to be ungrounded or inaccurately understood." It may not be an accurate or even fair comparison, but the mysteries in this series to date, including Fatal Induction, have a Sherlock Holmes-esque quality to them, featuring a man with a keen eye and sharp mind, who uses deductive reasoning — and "modern" technology — to solve a crime …though Bradshaw is far more humble than Holmes ever was. It's all really quite well done. Acknowledgment: Poisoned Pen Press provided an eARC of Fatal Induction for this review.